If you are a fan of the honey we sell at our town market and our farm market we want to introduce you to John Staite and his family who have been tending their beehives close to home in the Mount Albert area north of Stouffville for the past 20 years. John Staite with a swarm of bees that will be settling into a new hive. This family of four share responsibilities in all parts of the honey-making from gathering honey in the bee yard, tending to their hundreds of hives with about 60,000 bees per hive, packaging and delivering their honey to we lovers of the sweet stuff. In their honey house they filter and bottle the golden honey ready for delivery. Reesor’s is situated close enough to their honey house that we get frequent delivery of their beautiful, freshly bottled honey, bottled pollen, Royal Jelly and fresh honeycombs when they are available too. Will you be home-preserving tomatoes this year or will Thomas’ Utopia Brand be doing it for you? 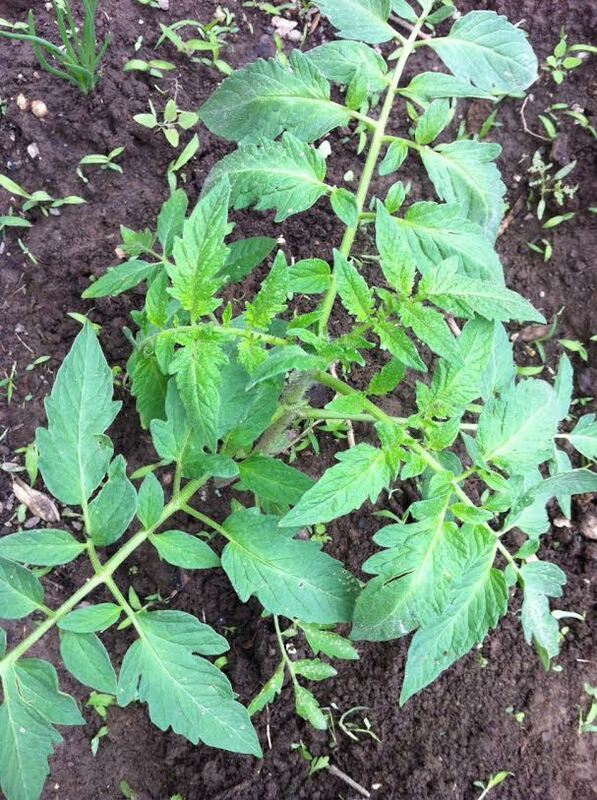 At Reesor Farm on the Ninth Line in Markham we’ve planted all of our tomatoes and we’re looking forward to picking them for you in August and September. Have you thought about making your own preserved tomatoes by canning, freezing or drying them this year? Home-preserved or purchased canned tomatoes are a great pantry staple and an easy way to make flavourful pasta sauces and soups all year-round. The third generation of the Thomas family is now overseeing their cannery. Are Thomas’ Utopia Brand’s canned tomatoes packed in cans with enamel lining that contain Bisphenol-A? None of our Thomas’ Utopia Brand tomato products use BPA in the manufacturing of the can lining. Do Thomas’ Utopia Brand Tomatoes contain the antioxidant lycopene? 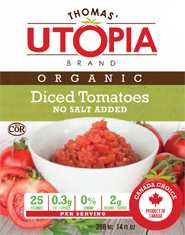 All Thomas Utopia Brand tomato products contain the antioxidant lycopene. Are Thomas Utopia Brand Tomatoes gluten free? Thomas’ Utopia Brand canned tomatoes are gluten-free. Ingredients in our canned tomatoes include tomatoes, water and sometimes salt. It’s almost a year since we moved our town market from Ringwood Dr. opening on Main St., Stouffville. After some renovations at our kitchen and bakery on Ringwood Dr. our team of bakers and cooks have been able to spread out and have more room for making food for you–all from scratch. We like to say that we cook and bake using the same ingredients that you use at home. Remarkably, our wonderful bakers and cooks make over 60 kinds of cookies, cakes and muffins, and more than 50 kinds of entrees, soups and salads. Plus our bakers on Main St. make more than 20 kinds of pies, so that there are always good smells welcoming you as you walk in the door at Reesor’s. All of the fresh soups and entrees, fresh bread, muffins, and cookies sold at Reesor’s are made in our own premises on Ringwood Dr. right here in Stouffville. We have an amazing team of bakers and cooks who work together, talk about food together and who keep the kitchen and bakery humming. 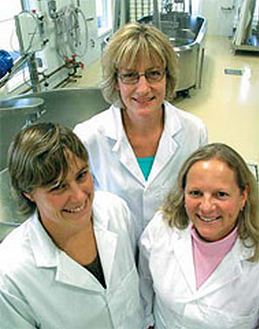 They are our key food producers working from early in the morning to make the best and most delicious food in small batches for true homemade taste. 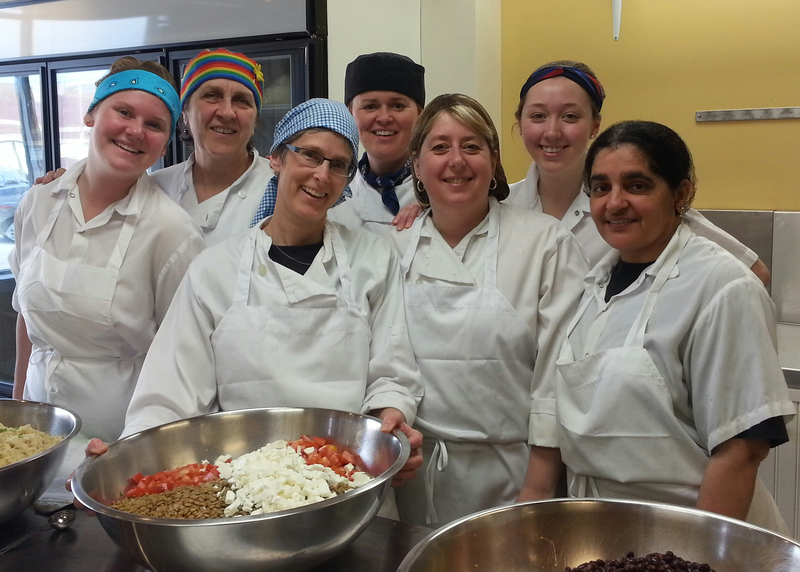 Harley (above left) graduated from the Culinary Arts program at George Brown College. She and assistant Diana were cooking up and packaging our Spicy Black Bean Soup on a recent Monday morning. Sandra brings her years of family cooking and professional baking to Reesor’s where she has been managing the bakery and kitchen for the past eight years. Sandra loves to bake and it’s her labour of love to make cinnamon rolls for you each week. Joyce our head cook for the past nine years also gets to work on her canoe paddling technique while making our vegan chili. Maybe she has paddled to Newfoundland and back? Pam started with us as a bakery helper and it turns out she has a unique gift for bread. She learned the art and science of bread under the watchful eye of Gail who taught her all things bread before she left us for full-time motherhood. Did you know that all of the cheeses offered at Reesor’s are solely from Ontario and Quebec? This year special congratulations are due to the cheese-makers at Glengarry Fine Cheese in Lancaster, Ontario, for their recent award in Somerset, England as Global Supreme Champion at the 2013 Global Cheese Competition for their “Lankaaster Loaf Aged” cheese. Their “Celtic Blue” won a Bronze in the Blue Vein Cheese, as well. We carry both of these award-winning cheeses at Reesor’s Market & Bakery in Stouffville along with several other cheeses made by Glengarry including Gouda in several flavours such as cumin. The Lankaaster Aged is is a hard cheese with a slightly open texture formed in a loaf shape reminiscent of the Dutch farmers who traditionally slice and eat it on bread. You can also use it when when you want to bake cheeseau gratin on potatoes or casseroles. It tastes lovely alongside a fresh Ontario apple too. The Celtic Blue is a soft creamy blue cheese, with delicate blue veining and a natural rind that is developed by specific ripening cultures. The typical blue taste is mild and is softened by a nice buttery aroma making it a good addition to a cheese plate. At Reesor’s our customers have been enjoying Velvet Sunrise for several years, but after tasting Clipper Coffee at the Stouffville Farmer’s Market in 2012 we knew we had to add it to our coffee bean selection as well. Gary and Darlene Carlton, owners of Clipper Coffee in Mount Albert, Ontario are offering wonderfully fresh, Fair Trade, organic, hand roasted Arabica coffees. On their first trip to Peru in 2006 Gary and Darlene tasted for the first time what really good coffee can be like. They have been going full sail since then establishing their company with a commitment to searching out the best in premium coffees. 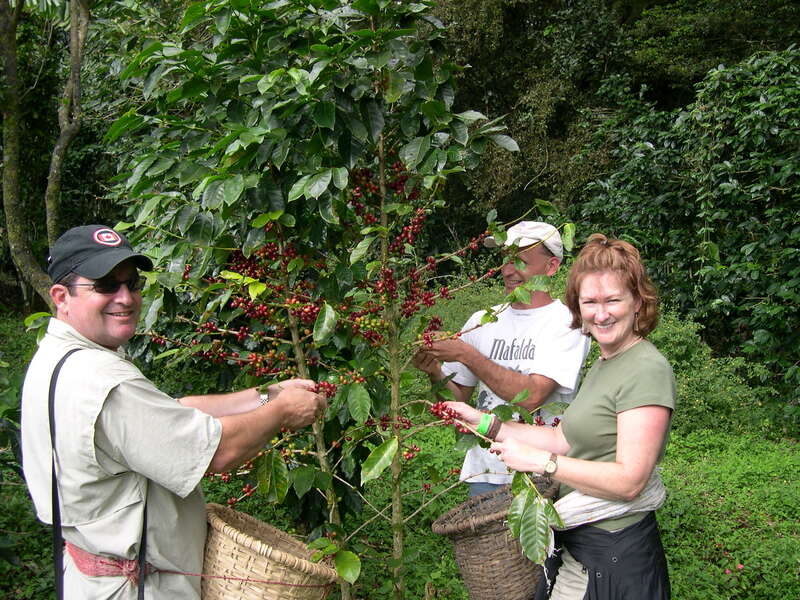 Gary and Darlene Carlton owners of Clipper Coffee picking ripe coffee berries in Costa Rica as part of their mission to know coffee from farm to roaster. Gary and Darlene have travelled all over Central and South America over the past seven yearsand have an appreciation of what farmers and pickers go through to grow the second-most traded commodity in the world–coffee. They have picked coffee, watched and helped with the processing, and most of all have gathered a ton of knowledge about coffee first-hand. When they aren’t visiting coffee estates or co-ops around the world their coffee broker assists them in picking the best beans available, which are then shipped directly to their Mount Albert roasting facility. 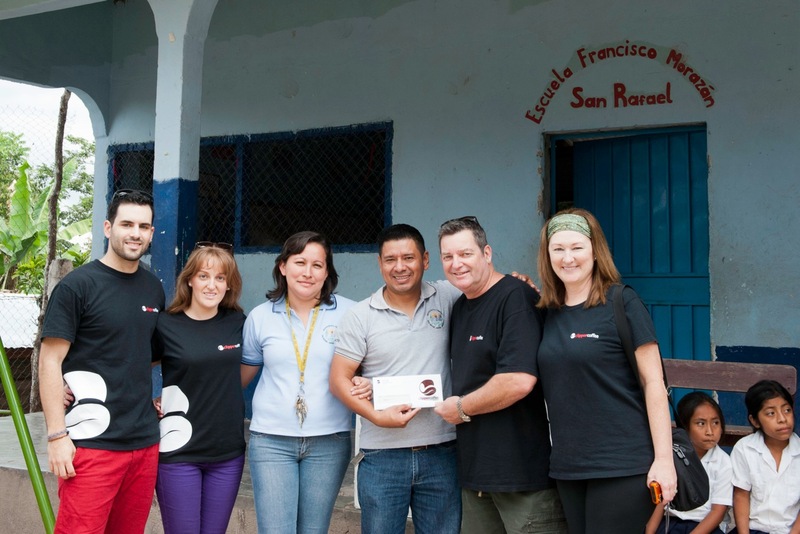 Clipper Coffee fundraising in Ontario last year raised funds and supplies for three Honduran schools in coffee-growing areas. At Reesor’s Market & Bakery we love a cup of coffee, which is one of the reasons we made sure to have our coffee bar right in the middle of the store and brew the same premium beans that we sell. We carry a variety of roasts and countries of origin from both Velvet Sunrise and Clipper Coffee. If you are a tea drinker check out our selection of premium quality Clipper Tea too. If you live in central Stouffville you might remember when Mark Hayward was experimenting roasting coffee from his home. Or perhaps these days you can smell roasting coffee as you drive down the western end of Stouffville where his Velvet Sunrise roastery is now located at Ringwood Dr.
Reesor’s is now offering Velvet Sunrise Coffee in its new orange, 400 g package where you can check out the roasting date and details such as organic or fairly traded or country of origin. 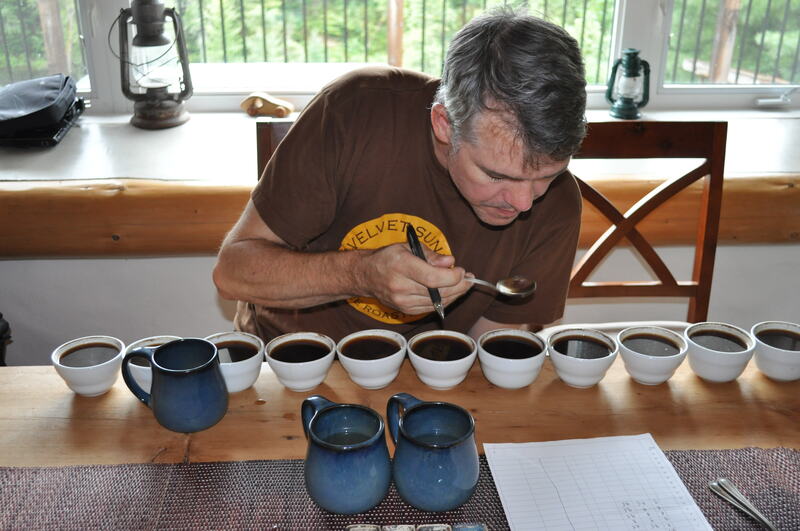 Mark Hayward owner of Velvet Sunrise coffee does a cupping and tasting process for each of his coffee varieties to select which beans to use for which roasts of coffee. 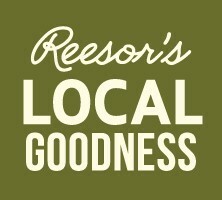 From Wed. Aug. 21 to Tues. Aug. 27 Reesor’s Market & Bakery is offering all Brooker’s sausages at 20% off. Look for them in our white freezers. Enjoy! Tom Brooks the owner of Brooker’s Natural Meats in Schomberg, Ontario has established a unique way to bring Ontario meats to a few select stores. Tom comes from a grocery store owner background and in 2009 began to envision a healthier way to eat than what has been available in the mainstream grocery stores. That vision helps him continue his labour of love providing Ontario meat to people who are becoming increasingly interested in their food sources. 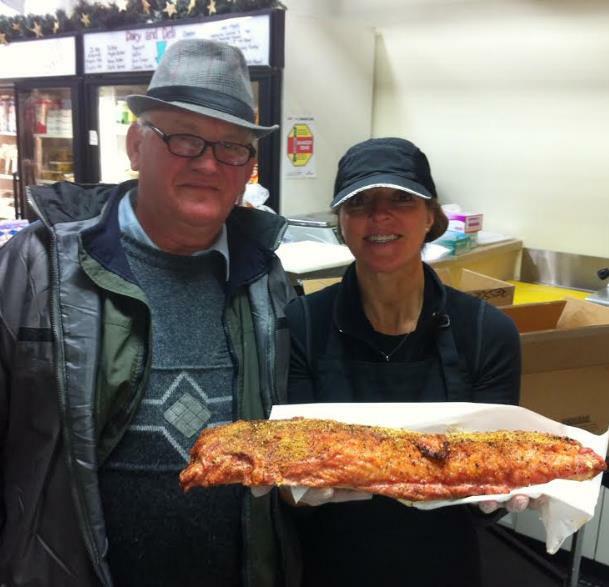 At Reesor’s Market & Bakery in Stouffville we offer a range of Brooker’s Natural Meats including chicken sausage and chicken burgers, pork sausages, and beef hotdogs. All of our Brooker’s meats are gluten-free. We are loving their chicken sausage on the BBQ and loving the short ingredient list: chicken, water, salt, raw sugar, parsley, chives, leeks, garlic. You can also try their Mild or Hot Italian, Honey Garlic, Spinach Feta, and Oktoberfest pork sausages or the nitrate-free pea-meal or sliced bacon. Brooker’s chicken products are made from chickens raised using no hormones, no antibiotics, no pesticides and fed on a diet that is 100% organic. All are raised in a large, ethical, well-ventilated environment with free access to the outside. The pork products are made from pigs that are allowed to forage and root through the grass for everything they need to be raised naturally. 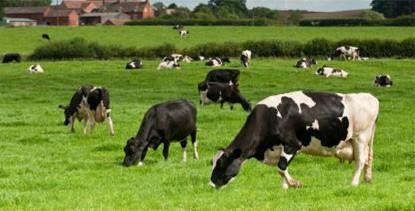 Their pasture diet is supplemented with a 100% GMO-free organic grain feed. Even the Brooker’s beef hotdogs are gluten-free and nitrate-free and made from cattle that have a diet of 100% grass in the summer and grass silage during the winter months. Brooker’s individually seals and flash-freezes their meats and you can store them in your freezer for up to six months to a year with no danger of freezer burn. Look for Brooker’s Natural Meats in our white freezers.